It is an IP Virtual Private Network (IP VPN) Service that allows all types of offices to interconnect with each other in a simple, efficient and secure way. The letters MPLS (Multi Protocol Label Switching) refer to a technology network developed to bring layer 2 switching speeds to layer 3 networks. It uses a mesh topology (all to all), although partially meshed or star topologies can also be created. 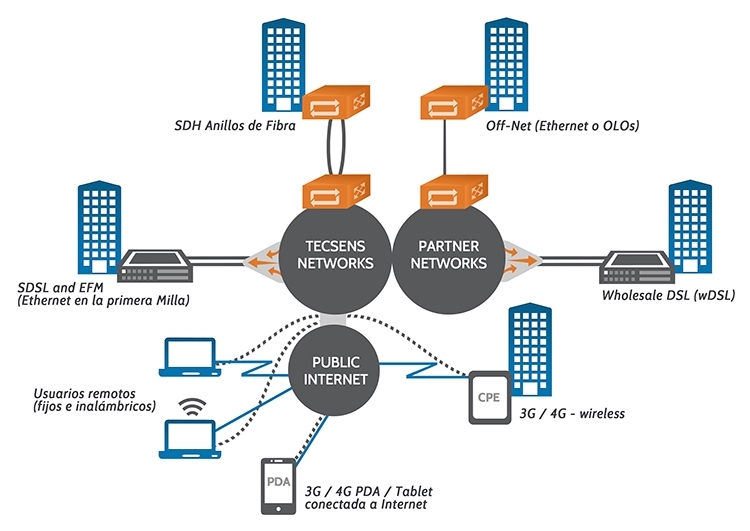 The offices on the IP VPN connect directly to the Tecsens fibre network, depending on the different access options available at each location. Class of service (QoS) makes it possible to identify different traffic types and prioritise them appropriately so as to ensure an excellent quality of service. Double Installation (of FO): Fibre optic cables come into the building from two different points. Dual Access: Double equipment and double circuit configured for high availability. ISDN Backup: system with automatic switching to the backup ISDN circuit. DSL Backup: system with automatic switching to the backup wDSL circuit. 3G Backup: System and antenna with automatic switching to the 3G circuit.